In the Victorian and Edwardian periods, fancy dress costume tended to be inspired by historical periods and characters and their associated dress. However by the 1920s and 1930s, costume drew on modern and topical themes alongside the more traditional and stereotypical representations both of the past and of other nationalities and countries. 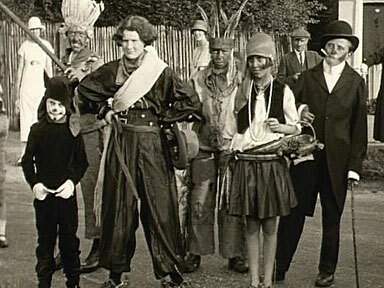 This film of Reigate Carnival shows an array of costumes from nurses uniforms, milk maids, male drummers, a woman dressed as a warrior to a person in a wooden beer barrel promoting a particular brand of ale. This film shows a fancy dress game of ‘living bridge’ where women and young girls wear cotton day dresses with sandwich boards on the front. Each board depicts a single playing card. It was not just fancy dress that incorporated such references. In the late 1920s, Schiaparelli included crossword puzzles and bridge motifs into her sweaters. Ref: 1991.81.2, Horsham District Council. Horsham Museum has a fancy dress outfit from ca.1933 promoting the Milk Marketing Board. 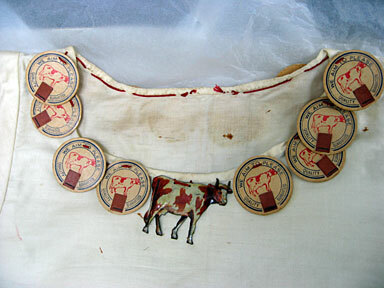 It consists of a blouse decorated with a metal cow in the centre and twelve cardboard discs depicting cows decorate the neckline. The discs declare, “We aim to please. Quality Guaranteed”. The outfit is complete with a hat and a full-length skirt with vertical banners promoting the consumption of milk. Children also participated in the carnival and their outfits included a flower girl and a young boy dressed as a devil complete with horns. In this film Joseph Emberton’s two daughters, Jocelyn and Gillian, are joined by two other children, possibly their cousins, for Christmas dinner. They all wear fancy dress costumes. Jocelyn and Gillian are in similar Pierrot costumes, complete with pointed hats and red wool pompoms. Jocelyn wears a white satin loosely fitting suit covered in a thin veil of netting with a frilly collar, whereas Gillian wears a more feminine version with a sleeveless top and layered net skirt resembling a ballerina’s tutu. The boy is dressed as a toy soldier, probably taking inspiration from the Nutcracker ballet. He wears a white tunic with red collar and shiny gold frogging, red breeches and a red tall hat with a front peak, upon which a gold paper trim and white feather have been stuck. The girl appears to be dressed as a Bavarian maid in a short-sleeved muslin top, pinafore dress and patterned apron and headscarf. Such folk and ethnic references were seen in fashionable dress, as well as fancy dress costumes in the interwar period. Chanel used Russian folk details in her designs of the 1920s and employed Russian émigrés who had fled to Paris in her workroom. Schiaparelli also looked to other cultures and included Congolese motifs on her sweaters in 1928. In the 1930s Chanel produced ‘gypsy’ style eveningwear. The Metropolitan Museum of Art, New York has a 1939 example (C.I.58.34.18a-c). In this children’s fancy dress competition, costumes range from dolls in boxes, aviators, and Mickey and Minnie Mouse to brands of ice lollies, to Lyon’s ‘Nippy’ waitresses. The Lyon’s catering business was a popular chain of ‘Corner House’ restaurants and tea shops. In 1925, the uniforms worn by the waitresses were revamped making them more streamlined and the waitresses were popularly known as ‘Nippies’ due to their fast service. As an alternative to domestic service, many young women in this period preferred to get employment in the more ‘glamorous’ roles of shop girls and waitresses.